After hanging out at the rig yesterday and letting Linda's injury rest, she felt a little better this Monday morning and said she was up for driving. We only had about 80 miles to go, so we didn't rush. We left the Bolado Park Event Center, and drove just a few miles to Tres Pinos where we parked on the side of the road in the little town. I carried the laundry to the little laundromat there, and helped get it into the washing machine. Then I dropped off our Florida ballots at the post office right by our motorhome. They had a little over a week to arrive at the Clay County Supervisor of Elections Office. As long as they get there by 7:00 p.m. election night, we're good. After returning emails and doing some other work in the rig, I returned to the laundromat and transfered the clothes to the dryers. After the laundry was done and transferred back into our rig, we drove to Carmel where we made a stop at the Safeway there to stock up on groceries before heading down Hwy 1 on the central California coast. Now, the coast from Carmel to San Simeon, about 90 miles along California Highway 1, is known as Big Sur which is derived from the name given the area in the late 1800s by the Spanish, el país grande del sur ("the Big Country of the South") which was often shortened to el sur grande, because it was a vast, unexplored, and impenetrable land south of their capital at Monterey. Today, we were going a little less than 30 miles down Hwy 1 to the Pfeiffer Big Sur State Park. On Saturday, I found that they had a few sites available for today through Thursday, so we picked one using CampsitePhotos.com to choose a site. 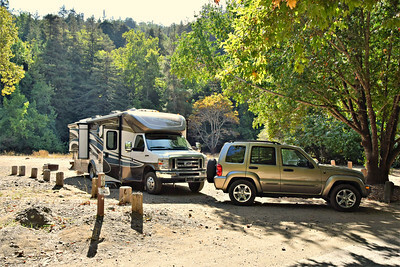 The park website shows a 32-foot motorhome and 27-foot trailer length limit. I made a reservation through the Reserve California system, or at least I thought I did. More on that later. Highway 1 is a curvy road with lots of ups and downs, and Linda didn't like driving it in our 30-foot motorhome. Though we saw one big rig on that stretch, we never would have taken the fifth wheel on that road. Views along the rugged coast were nice and there were lots of turnouts, but we just made it a priority to get to the state park which we could use as a base to explore. We arrived around 4:00 and drove into the heavily treed, dark park. At the entrance station, we gave our name and reserved site number. But they didn't have the reservation. I checked my email and opened my confirmation email to show the young lady. Unfortunately, the email wasn't a reservation confirmation; it was just a confirmation that we set up an account with the reservation system. They called the reservation company for me, and handed me the phone. They verified my account, but showed no reservation or payment. Sheesh. I just need to verify with our bank that we didn't get charged. Fortunately, our site was still open and we could pay for two days only and then we would have to check back each day to see if the other two days were still available and pay one day at a time. Well, at least we wouldn't have to pay the extra $8 reservation fee, but the site could be reserved out from under us unless we went online and reserved the other two days. We decided to take our chances as I knew there were about five sites available and we could move if we had to. Driving back to the campground, the roads were pretty narrow but we did okay not unhitching until we got to our site. There were a couple rigs slightly bigger than ours, but it's definitely not a "big rig friendly" place. The site we chose - Site 25 - which, on CampsitePhotos looked like would get sun, would get no sun this time of year with the lower sun angle. So, we moved to Site 73, a site where we would definitely get sun on our solar panels. In the site we originally chose, we got no sun, our satellite radio didn't work, and our cellular data was barely workable with a booster. In Site 73, we get sun, we get satellite radio, and we get decent, consistent (though not speedy) internet without needing the booster. Oh yeah, there are no hook-ups here. They have a dump station and a place to take on water and several water spigots (some threaded, but most not threaded) scattered throughout all three camping loops. And it's $35 a night for no hook-ups, unless you get a "River" site, then it's $50 a night, and I can tell you the River sites are not worth the extra money (in my opinion). They charge an extra vehicle fee, but "legally towed" vehicles are included in the base price. A couple good things about the pricing. One, they don't charge you a park admission fee on top of the camping fee, and two, your camping receipt is good for visiting the other state parks along the coast without paying an admission fee (except for Lime Kiln for some reason). They do have a laundry, but 4 of the 7 machines are out of order. We're in the middle loop, the South Camp, and there are about five sites like ours that are out in the open. Other than that, all the other sites in all the camping loops are heavily shaded, some of which are shaded by coastal redwoods. Yes, there are redwoods here including a few big ones, but they don't compare to the much larger, more impressive specimens farther north. One other thing. 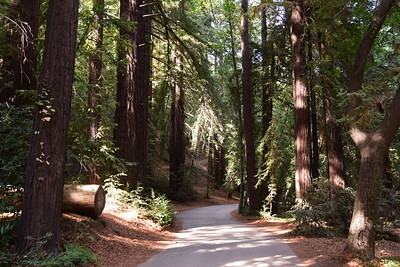 The park provides those traveling through on Hwy 1 with the option of staying overnight (one night) in one of their Day Use parking lots ..... for $45. I don't think too many people are taking them up on that generous offer. 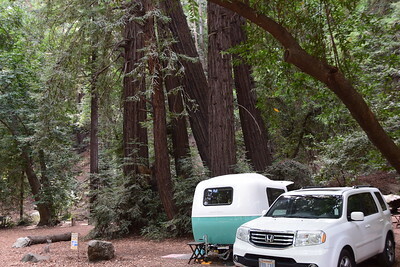 Okay, so we're here and parked in Big Sur. The next couple of days, we'll explore the coast and check out the elephant seals down closer to San Simeon. I don't recall ever seeing elephant seals in the wild before, so we're looking forward to that. We'll report back with what we find tomorrow.